Expect to hike about 4 miles with a 200 foot elevation gain. We will be looking for waterfowl, which should be plentiful and visible along the trail. If we are blessed with some decent rainfall, we may also see early spring flowers. Meet at the Mabel French Boy Scout Camp. Directions: From Arroyo Grande, follow the signs towards Lopez Lake. After crossing the dam, but before entering Lopez Lake County Park, turn right on Hi Mountain Road and proceed 0.8 miles to the junction of Upper Lopez Canyon Road. Bear left on Canyon Road and proceed 3.6 miles to the entrance of the Boy Scout Camp, on the left (west) side of the road. Park in the parking lot, where restrooms are available. No day use fees are charged as this area is outside of the fee area. Bring water and snacks, and dress in layers for changing weather. Bring: A hat, sunscreen, and sturdy shoes are recommended. Contact: For more information, call Bill at (805) 459-2103 or email bill.waycott@gmail.com. Rain or the threat of rain cancels. Sunday, April 6, 2014, 9 a.m.
Meet at the La Purisima Mission Parking Lot, corner of Purisima and Mission Gate Roads (2295 Purisima Rd. Lompoc) at 9 a.m. for this annual California Native Plant Society and Sierra Club spring tour of the beauties of the Burton Mesa Chaparral. This is turning out to be a fair year for wildflowers, annuals as well as shrubs; Optional afternoon tour. Description: The California Native Plant Society and Lompoc Valley Botanic and Horticultural Society will hold their annual winter field trip to the Burton Mesa Chaparral on the La Purisima Mission grounds. Meet at the east end of Burton Mesa Blvd. (1550 E) in Mission Hills at 9 a.m. for a chance to see the early bloomers and interesting scenery. To reach Burton Mesa Blvd., go to State Route 1 north of Lompoc. At the signal where SR 1 turns down hill towards Lompoc, take Harris Grade Road north to Burton Mesa Blvd., and turn right (east). For more information call Charlie Blair at 733-3189. Description: Saturday, April 12, 2014 9:00 a.m., Wildflower, Native Plant Week, and Earth Day Weekend at Figueroa Mountain. The Santa Lucia District, Los Padres National Forest will hold one of its Wildflower Weekends on Figueroa Mountain in conjunction with the California Native Plant Society. This tour will feature a local celebration of the third California Native Plant Week (3rd week in April, the 14th – 21st this year). Meet at 9 a.m. at the Fire Station on Figueroa Mountain Road. Turn left at the SR 154-Figueroa Mtn. Road intersection near Los Olivos, and proceed to the Fire Station parking lot. This will be a “drive and stroll” tour of this year’s display. Sturdy shoes, lunch and liquids, and camera and binoculars recommended. Call Helen Tarbet at 925-9538 ext. 246 or Charles Blair 733-3189 for details. Description: Saturday, February 8, 10:00 a.m., Lichen walk, Fiscalini Ranch, Cambria. CNPS member Al Normandin will lead a short stroll through the Cambrian pine forest looking for lichens. Ever present yet mostly overlooked, general information about lichens’ unique characteristics and living strategies will be presented. Most of the species will be identified with easy to remember common names. If handy, bring a magnifying glass (or binoculars, which if used backwards serves as a magnifying glass) to see individual features up close. This is not a CNPS sponsored event. Reservations required. Contact: reservations@cambriaranchwalks.com or call (805) 927-2202. CNPS-SLO is awarding the McLeod Scholarship to Natalie Rossington, a Master’s student studying Biology at Cal Poly where she also received an undergraduate degree in Soil Science. She enjoys botanizing in the spring, photography, and cooking in her free time. Natalie grew up in Santa Barbara and currently lives in Morro Bay. Natalie Rossington will be studying the distribution and ecology of native populations of Layia jonesii and Layia platyglossa in Reservoir Canyon by using a reciprocal transplant. She will also investigate the pre-zygotic and post-zygotic barriers between the two species by performing a hybridization study. She hopes to find new populations of L. jonesii throughout San Luis Obispo County during Spring 2014 and 2015. The CNPS Horticulture Program has begun running a series of articles in the CNPS Bulletin on native plant gardens of CNPS members. The first one appeared in the Oct.–Dec. 2013 issue on page 7. Depending on the response, this series could become a regular feature in the state newsletter. The purpose of the series is to inspire others to create their own native plant gardens, or to add natives to an already existing garden. If you have a native plant garden you feel is special and beautiful, and if you would like to share it with others in CNPS, send us an inspiring article draft of 575–600 words. We hope you’ll include your experiences with the garden, as well as just describing what’s there. Also include two high-quality photos (in jpg format, not close-ups) that show off your garden, and one-sentence captions for each. Send your submission to Susan Krzywicki, CNPS Horticulture Program Director, at skrzywicki@cnps.org. If we feel your article can be published, we will work with you through the editing process until it’s in a final form. We look forward to hearing from a number of CNPS members! In public meetings the company denies this. We just love those tank train fireballs from Baaken crude. The problem with this multinational corporation is the manner in which it got approval to increase production by 10% in 2008 without mentioning the railroad spur, which it introduced as a new project two months later. It then stated that the spur would not induce an increase in production. Duh! Added to that is the county making an analysis of a southern route into the OHV riding area as part of the same document, but failing to address this through the normal CEQA process of evaluation of alternatives. As noted in President’s Notes, we need as a scientific organization to start recording vegetation changes over long time periods. We need your past, present, and future photographs that record vegetation at locations that can be identified and revisited. For example, the vegetation on the old dunes north of Spooner’s Cove in Montana de Oro appears to be changing, and we would like pictures from the past. If you are taking photos in future, when you return from the field we would like you to open up Google Earth, put the curser on the place you think you were standing, and copy the latitude and longitude at the base of the screen. You can email us the picture and the metadata. Any county landscapes that show the plant community reasonably well will be welcome. I am also going to start photographing the Carrizo Plain, both on a grid and at points of particular interest. I would love to have volunteers work with me on this. As everybody is talking drought, there seems to a certain inertia in regard to doing anything about it at the county and agency level. The jet stream is weakened to the point that it no longer shoots from west to east, but instead wanders like a drunk across broad latitudes, bringing Baja-like conditions to us and polar conditions to the Midwest. The intensity of the high pressure in the North Pacific is extreme, and thus there is a very strong possibility that the spring of 2014 will echo that of 2013 and be rainless. With this in mind, an organization that treasures wildflowers is going to have a hard time finding any. We have already had to cancel the yearly “fungal foray” in the Cambria pines. In terms of impacting our vegetation, this could be a “geological” event, in which another year of drought could start a cascade of ecological collapse. But each collapse is followed by rebirth, possibly with a different mix of plants. Maybe we will be able to enjoy the cholla cactus fields of Creston where all those grapes used to be. Last year perennial shrubs still made a good show, living off the rains of late 2012, but this year might result in some mortality. CNPS is very interested in recording the effects of this drought, so please record what you see for the sake of science, and let us know. Field trips will still be very interesting, as we will be looking at a landscape in-extremis, and we don’t often get that chance. I want this recorded . . . read further under Conservation. All three of Bonnie’s drawings this time are of manzanitas. One is a repeat of the endemic rare plant commonly known as Morro manzanita or Arctostaphylos morroensis. As you will see, it is included here to serve as a basis of comparison. The other two drawings are new. One is of a single manzanita plant (maybe a clone) that grows near the mouth of Turri Creek where the Elfin Forest group’s 3rd Saturday Natural History Hike goes when it visits the salt marsh. It is currently in flower. The last is of a species commonly called, dacite manzanita (A. tomentosa ssp. daciticola). It grows nearby in the hills above the mouth of Turri Creek. There are two other manzanita species that could also complicate the identification of our mystery manzanita. The first and most problematic is Oso manzanita (A. osoensis). Its recorded range is further away from our mystery, but still in the Turri Creek drainage. It is recorded as occurring on higher ridges and plateaus west of Hollister Peak on sandstone or dacite outcrops. The last possibility is the Arroyo de la Cruz manzanita (A. cruzensis). It is this species that our plant would be if we used Robert F. Hoover’s 1970 edition of The Vascular Plants of San Luis Obispo County, California, for identification because it is the only species (other than A. morroensis) recorded for the area. Dacite manzanita and Oso manzanita were not recognized by Dr. Hoover as valid names. So which name should we apply to our unknown manzanita? All who have attended these hikes readily concluded that the new manzanita is NOT the Morro manzanita. So if it is not Morro manzanita, what manzanita is it? This question, it turns out, is not easy to answer. This is where the third manzanita drawing comes in. It represents the dacite manzanita (Arctostaphylos tomentosa ssp. daciticola) which is one of two species found growing on the dacite, a granite-like rock which is dominant rock making up the Morro Sister Peaks. Outcrops of this rock weather into thin, infertile soils. Dacite manzanita is found only within the Turri Creek drainage. I assume most will agree that, if our unknown is not Morro manzanita, it shows a much closer, but not perfect match to the dacite manzanita. The identification of manzanitas is not easy. First, there are many species (60+ and many subspecies and varieties) recognized as growing in California. Second, I suspect all who have even a passing familiarity with California native plants can identify a manzanita. This means the genus has an easily recognized set of characteristics. It also follows that telling its many species apart is going to be a challenge because species characters must be of necessity minutely different or technical in nature. However, they can be divided into groups based on the length of their leaf stalks (petioles) and the shape of the leaf blade base. One group, which includes the Morro manzanita, has an easily seen but short (< 4 mm) leaf stalk (petiole) and a smooth, rounded to chordate blade base. A chordate leaf base is going to resemble the top of a valentine heart. The other group has petioles either absent or so short (< 2 mm) that they would not easily be seen unless one looks carefully. Their leaf bases also resemble the top of a valentine heart (chordate). Neither of these traits is present in Bonnie’s Morro manzanita drawing which was probably based on a plant from Montana de Oro State Park. But they are found in the other two drawings. There are other technical attributes of course, but most of these are not visible without a microscope or hand lens. One character that does not require a microscope, but does require some “digging” is whether or not a manzanita produces a large swelling at the junction where the root turns into the base of the stem. In those that don’t produce the swelling, which includes the Morro manzanita, branching doesn’t usually begin until the main stem (trunk) is a few inches or more, sometimes up to a foot or more, above the ground surface. These are called tree manzanitas due to that single trunk. Those that branch from the swelling below ground are commonly called shrub manzanitas. Manzanitas that produce this structure tend to form their first branches below ground which produces a bunch of stems in a tight cluster. Again this trait should eliminate the Morro manzanita from consideration because it usually begins to branch at or above the soil surface. So if it is not Morro manzanita, which of the other manzanitas is it? The Arroyo del la Cruz manzanita, as currently defined, should range from Cambia northward. The Los Oso manzanita is reported to be a relatively tall shrub (3 to 12 feet) and is reported to be restricted to dacite or sandstone outcrops. The dacite manzanita occurs just up slope from our mystery manzanita but is also supposed to be restricted to dacite outcrops. Our mystery manzanita grows on a relatively narrow terrace well above the salt marsh and just below the foundation fill used to raise South Bay Boulevard above the Morro Bay estuary. It is growing in coarse sandy soil probably derived from the fill. It is growing with species characteristic of coastal scrub with a large compliment of weeds. That is, it is growing in a classic, disturbed, man-made habitat. Such habitats are known to allow unusual individuals such as hybrids to occur out of typical range or habitat and become established. In other words, range and habitat can’t be used to limit the possible ID. So what is its correct identification? I’m still quite unsure. Even the Cal Poly Herbarium is not much help here. I think I could find all three possible species among the specimens within each single species folder in the Cal Poly Herbarium. I do have to admit that the differences among the three short petiolate, chordate leaf-based species depends on the often subtle nature of the kind of hairs (pubescence or trichomes) found on twig and leaf. As stated earlier, these traits require at least a hand lens to observe. I think it is safest to leave it as a mystery manzanita. Maybe, a Cal Poly Senior Project or Masters student will take on this project and find the correct answer for us. It appears that all the species from the Turri Creek drainage are closely related, at least based on appearance. 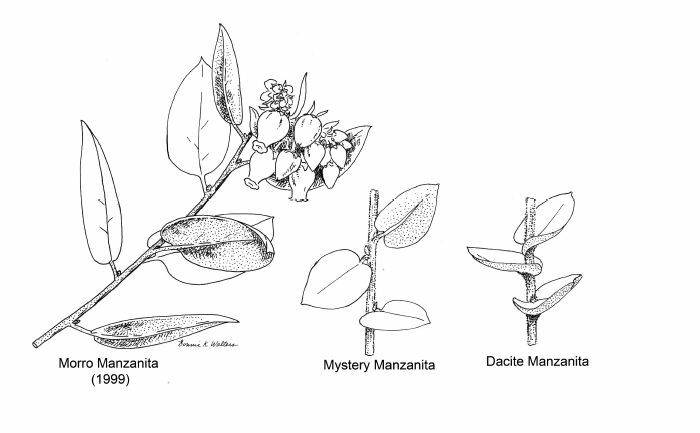 With additional modern taxonomic techniques maybe it may even be determined that Dr. Hoover was correct back in 1970 when he concluded that all (except Morro manzanita) are the same species. P.S. After writing the preceding paragraphs, I went back out and observed the three pictured manzanitas again. This time I walked through the Elfin Forest to reacquaint myself with the variability found among Morro manzanita individuals. The plants along the Board Walk are similar to Bonnie’s drawing. But if you observe the manzanitas along the Habitat Trail that goes off the north-east curve and goes toward South Bay Boulevard, you will find that the Morro manzanitas get shorter and shrubbier and their leaves have shorter petioles and more deeply lobed leaf bases. It’s a mini-cline. In other words they begin to resemble more and more our mystery manzanita. So, I’m forced to conclude, at least tentatively, that our unknown manzanita is simply an extreme form of Morro manzanita. If so, it may be the most northern individual of the species. I conclude this in spite of all of us assuring ourselves that is was clearly different from the Morro manzanita we all had pictured in our minds. I still think there is a good student project here, however.